I’ve been wanting to use my new grill more, but I’ve also wanted to still keep eating primarily vegetarian. I was having a hard time finding an easy main dish grilled veggie recipe. Our whole house loves cauliflower so when I came across this it looked like it was worth a try, and simple. I didn’t have any cilantro on hand which I’m sure would add wonders to the taste. 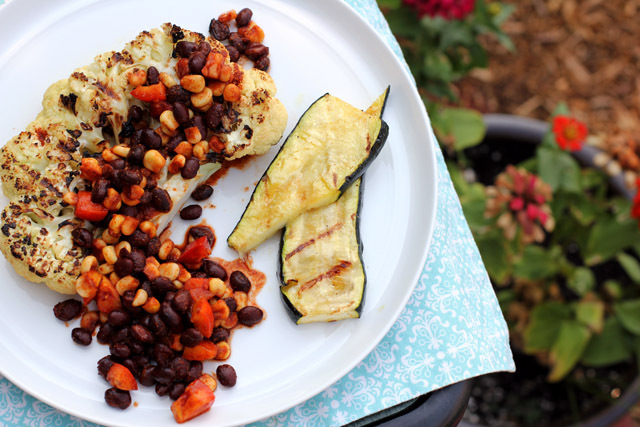 But I liked the combination of the cauliflower with the bean salsa. I grilled some zucchini as a side dish as well. I only cut two “steaks” out of the cauliflower head. I wasn’t sure how thick to make them either. Mine were probably an inch and a half thick. The recipe said to grill them 3-4 minutes on each side, but I did about 10 minutes. I’d probably do a little longer next time because they were a little crunchier than I would have preferred. I will definitely make these again with a few adjustments. It was just too easy and simple to not want to make it again. Korean BBQ portobello burgers still count, right? We were having friends over for a BBQ over the fourth of July weekend. And since I’ve never grilled before, I figured I should do a practice run with something just to make sure I got the hang of it. 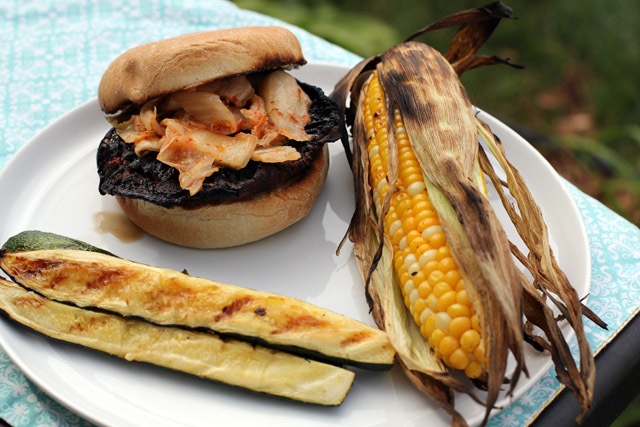 I made grilled zucchini, grilled corn on the cob, and Koren BBQ portobello burgers. No meat, but that’s what we decided on (I’ve been told if you don’t grill meat that it doesn’t count, which I suppose is a valid argument on some level). Anyway, I killed it for my first time! The corn was crisp and rich. We didn’t even use butter or salt! The mushrooms were juicy and meaty (as much as a vegetable can be). And the zucchini was, ok, maybe a little overdone, but still delicious. I think I’m going to love summer time grilling. Next up, Chicago style hot dogs! Recipe taken from Isa Does It, by Isa Chandra Moskowitz. If you enjoy vegan and vegetarian meals, I highly recommend you get this book. It’s my most used recipe source at the moment. Marinate mushrooms for an hour. Grill mushrooms 5 minutes per side or until done. I added the marinade as I grilled them. I wanted as much of the marinade flavor as possible. Spread mayo on lightly grilled buns. Place mushroom on bun and top with kimchi.